One of the metrics that indicates the quality of a webpage is the bounce rate. It’s a percentage shown in various Google Analytics reports and can be used by webmasters to analyze whether the content of a page satisfies the user intent. As a general rule of thumb, the lower the bounce rate of a page, the better. In this guide you will learn what is a bounce rate, how to view the bounce rate in Google analytics, what is the relationship between bounce rate and SEO and what actions you can take to reduce your bounce rate. What do we mean by bounce rate? A bounce rate is a percentage that shows how many users landed on a webpage and then exited the website, without having any interaction on the page. This means that they did not click any links on the page and this includes menu items and any other internal or external links. When you have Google Analytics installed on your website, it records all actions performed on a page. Once a page is loaded for the first time, this triggers a session and a request is send to the Google Analytics server. When the Google analytics server does not receive a second request from the same page, then it means that user did not interact with the page at all. This is considered by Analytics as a single-page session and it is taken into account when calculating the bounce rate of a page. Another characteristic of single-page sessions is that the ‘time on site’ is 0 (zero) because Google analytics does not have another request to use to calculate how much time a user spend on the page. So, if you have 10 visits on a page and 8 of them landed on your page and then left without clicking any of the links on your page, your bounce rate will be 80%. The bounce rate is calculated when users land on the particular page from an external resource (i.e. Google search) and not when they visit a page by clicking an internal link. The bounce rate for Page A is 50% because Page A had 2 landing page views and one exit. Although User 2 visited Page A as well, this does not count in bounce rate calculations because it was not a direct visit to the page. Many people confuse bounce rate with exit rate but they are not the same. Exit rate is the percentage of people that exited the website from a particular page. In other words, is how many people left your website from that particular page / number of pageviews that page received. Using the same example above, Page A has a 33% Exit rate because it had 3 sessions in total, one of which resulted in an exit. So, a bounce rate shows you how many people that landed on a page and left your website without doing anything else and the exit rate shows you how many people exited your website from a page compared to how many times that page was viewed. There is a big confusion in the SEO industry about the relationship between bounce rate and SEO and whether the bounce rate is a factor used by Google during the ranking process. 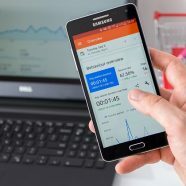 Many people argue that it is taken into account by Google, while Google says that they don’t use Google analytics metrics in their ranking algorithm. Bounce rate is a metric that is available in Google Analytics and yes, the Google ranking algorithm does not take that into account because a) they don’t have access to it and b) it’s not always accurate. As we will see below a high bounce rate is not always bad. When a page though has a high bounce rate it means 2 things (that are directly related to SEO and rankings). First: That the page did not satisfy the user-intent. This implies that visitors viewing that page are less likely to become customers or repeating users. They did not share the page or added a comment since they did not find what they are looking for. Second: If the visitor came from Google search, visited your page and then went back to the search results, then this is something that Google knows. In the SEO World this is known as pogo-sticking and it’s a signal to Google that your page did not satisfy the user intent. Google wants to keep their users happy so If a lot of users have the same behavior, then this will eventually lead to lowers rankings. A study by SEMRUSH found out that pages in the top positions of Google have an average bounce rate of 50%, which is consider good. Is a high bounce rate always bad? For example, when you have a blog post answering a specific question. Let’s say that you have a page listing the Federal holidays for a specific year. Users when they land on your page, they will read the answer and then leave. The page will have a high bounce rate but that’s not necessarily bad since the user intent was satisfied. There are websites that only have a homepage. Users can visit the page and then leave since the interaction with the website is limited to a single page. For example, when you want users to contact you by phone. They visit your homepage, see the phone number and call you. The page will show a high bounce rate but that’s not an issue. What is considered to be a good bounce rate? In general, the lower the bounce rate the better. In cases where you want users to interact with the page and website in general, a high bounce rate indicates that there is something wrong with the page. The following table shows the bounce rate by industry (source Google Benchmarks Data) but as mentioned above, you should aim for the lower bounce rate possible especially for the pages that are landing pages for Google traffic. The bounce rate metric is available in a number of Google analytics reports. To be able to figure out which of your pages have a high bounce rate so that you can improve them, you can view the Landing Pages report. The landing pages report can be accessed by going to Behavior -> Site Content -> Landing Pages. The bounce rate column shows the bounce rate of a particular page. You can further drill down by selecting Source as a second dimension to see how the bounce rate changes depending on the traffic source. Advanced users can also create Segments and break down the landing page data by device, demographics, location and many other factors. This is especially useful when you want to improve the bounce rate of your pages that receive Google traffic. Remember, bounce rate is calculated for landing pages only so the Landing Pages report is the most accurate report to start your analysis. Several studies show that slow loading pages is one of the factors that keeps users away (especially on mobile). One of the actions you can take that will not only reduce your bounce rate but also have a positive impact on your rankings and conversions is to improve the time it takes to load your website. According to Google, a good loading time for mobile pages is < 3 seconds. Users find full-screen popups annoying and so does Google. Popups that are loaded as soon as a user enters a page drives them away and is an action that is punished by Google (it’s against Google guidelines). A better alternative is to use an EXIT Popup (shown when users try to leave the page) or a fly-out popup shown when users stay on the page for an x amount of seconds or when they navigate down to a certain part of the page. A nice way to keep users on your website and reduce bounce rate, is to grab their attention by the use of a flyout window. This is a technique used by many websites (mostly news publications) because it’s a great way to ‘invite’ users to visit more pages from your website. Flyout windows can be used in many ways. For example, on my website I use them for social proof marketing. Once you land on one of my posts you will notice a notification box showing on the bottom left corner of the page that shows recent sales of my SEO Course. Another way that flyout boxes can help lower the bounce rate of a page is to display a notification box with ‘related articles’, ‘people are reading’, or ‘popular posts’ so that users can find something interesting to click, instead of leaving your website without interaction. Our own WordPress Plugin, WP-PROMO can help you create a number of notification boxes easily, choose when the notification boxes should be shown and what message to show in each notification box. You can either choose to promote one of our existing posts, products or write you own custom message. You can create as many notifications boxes you want without any conflicts. A webpage that is full of ads violates Google Webmaster Guidelines and offers a bad experience for the users. Contrary to what many people believe, using too many ads will not lead to more ad clicks but to a higher bounce rate and users leaving your website and not visiting again. What matters when you want to make more money from AdSense (or other forms of ads), is the placement of the ads and not the number of ads you have on a page. Another technique to encourage users to interact with your content and visit more pages from your website, is to use internal linking. Internal linking not only helps users read more about a certain topic but it’s also good for SEO and bounce rate. To find out more, read my previous guide on internal linking best practices (notice how I used internal linking here). Each and every page that you have on your website should have a goal. The goal of a landing page might be to sell a product or service, the goal of another page might be to get more email subscribers, the goal of a blog post to redirect users to another page on your website. That goal should be made clear to the user from the beginning and one way to do this is to test different call to action messages. This means trying different messages, different colors, different positions until you find out what triggers more interactions. If you notice in all my blog posts, I have three CTA Boxes (one on top, one in the middle and one below the post). I did several tests for months to find out which message to show in each box (including what colors to use, what button labels, etc.). In my case, this leads to more product sales and to a lower bounce rate. What is the relationship between page titles and descriptions and lowering the bounce rate of a page? It has to do with building the correct user expectations even before users visit your page. When users click on your link from Google search, they do it because of what they read in your title and description. If your content does not deliver what promised in the title or description then the bounce rate will be high. So, when crafting your titles and meta descriptions, don’t try to deceive users because eventually this will create the opposite results. It’s no longer the 90’s when a web page was just text on a page. In today’s world, you need to do more than that. Users don’t like to see text thrown on a page. Do some work on your page to show users that you care. Add proper headings, images and beautify your text using small paragraphs, bold and italics. This will increase readability, time on site and of course lower bounce rate. I have mentioned above that one way to lower your bounce rate is to make use of flyout windows to recommend users other content they may find interesting. While this is a very efficient way, another method to use is to give users options on what to do next. Place other widgets on your sidebar with links to your popular posts, popular topics etc. I use the above techniques from time to time depending on what my business goals are. Currently, my bounce rate is very low (way beyond industry average) so I’m only using some of the above techniques. Last but not least, do not forget that what will keep users on a page and website in general is the quality of your content. Provided that you are not doing any of the deadly mistakes, as explained above that can have a huge impact on your bounce rate, the single most important factor is the quality of your content. In fact, the bounce rate can help you evaluate how good your content is. A page that loads fast, does not have any popups that show on load, is not full of ads, and has content that is easy to read but still has a high bounce rate, then this is a signal that the content of the page needs to be improved. What you can do is to change your headings and make them more meaningful and re-write your content to give users the information they need. A good place to start is to look at the Performance Report in Google Search Console and find out for which keywords your page received clicks. Evaluate your content based on what users are searching and make changes to match the user intent. The bounce rate is an important metric to look at while evaluating the efficiency of your website. Correctly identifying which pages have a high bounce rate and taking actions to reduce it, is a step towards making your website more useful to users and this has a number of added advantages. One of the advantages is better rankings since visitors will stay on your website longer, navigate more pages and thus reducing the pogo-sticking effect, which can negatively affect your SEO. When analyzing the bounce rate of a page in Google analytics, make sure that it has a decent number of visits (and page views), otherwise the results may not be 100% accurate. Once you make a change to a page, compare the same period i.e. 28 days, before and after making the changes to see if the bounce rate of that page has been improved or not. The post What is Bounce Rate in Google Analytics and How to Reduce It appeared first on reliablesoft.net.